In recent centuries, too, she wept tears of sorrow: The account of the apparitions of Our Lady of La Salette on September 19, 1846, is very moving as is also the account of Mary’s tears at Syracuse. Today the devil has much power because we have forgotten sin and no longer believe that Satan exists. THE CHAPLET IS PRAYED WITH REGULAR ROSARY BEADS IF YOU DO NOT HAVE THE SPECIAL CHAPLET BEADS, EXCEPT YOU SAY SEVEN DECADES. Crucified Jesus! We fall at Your feet and offer You the tears of her who with deep compassionate love accompanied You on Your sorrowful Way of the Cross. Grant, O Good Master, that we take to heart the lessons which the tears of Your most holy Mother teach us, so that we may fulfill Your holy will on earth, that we may be worthy to praise and exalt You in Heaven for all eternity. R. For the sake of Your most holy Mother’s tears. At the end repeat three times on the small beads the invocations that replace the Our Father. 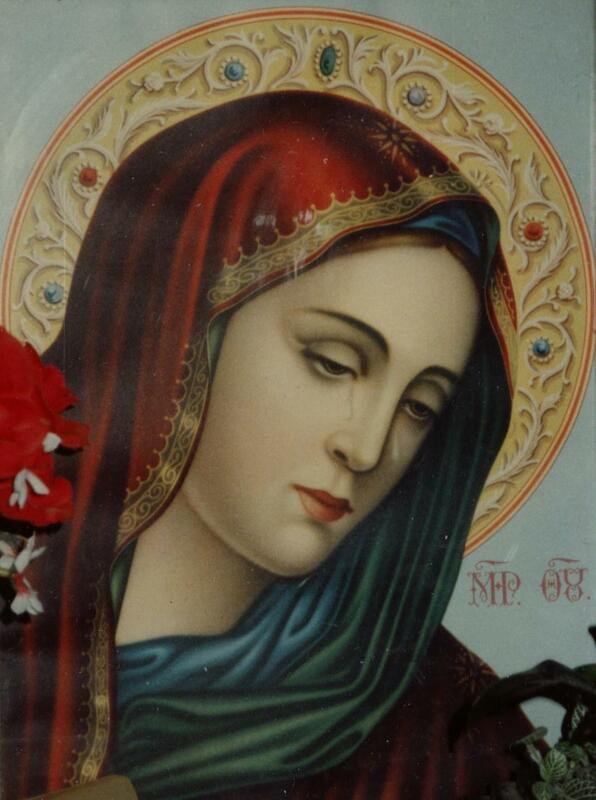 O Mary, Mother of love, sorrow and mercy, we beg you to unite your prayers with ours so that Jesus, your Divine Son, to Whom we turn may hear our petitions in the name of your maternal tears and may give us in addition to the favors we ask, the crown of everlasting life. Amen. This entry was posted in Devotions and tagged contemplation, meditation, prayer, Rosary, visions. Bookmark the permalink. This website is a wonderful source of inspiration. Also ,there is an integral, inscribed, double-sided oval medal, [available in several languages, including English] at the beginning – instead of the Crucifix, together with 4 small beads along the chain (1 spare – as in it exists, but no prayer has been assigned to it in the leafleted instruction.) following on from the aforesaid medal as illustrated within the picture of O.L. offering the rosary to her children – you and me. Therefore, the ordinary Rosary is not an appropriate substitute or as a ‘make do’ version requested, by Our Lady, no less. I tried that until I was able to acquire the white ‘pearl’ rosary as described, from the Pauline Sisters. I feel that the Ad at the back of the leaflet shows a hand intentionally covering the spare bead. This is also wrong as O.L. isn’t concealing it in the picture. It’s so easy to recite because the correct number of beads and sets are within one’s grasp. No further calculation is required. By the way, I’ve only found your website tonight and because I’m trying to ‘fill in the blanks’ with regard to the ‘spare’ bead and requiring the translation of the prayers on each side of the medal (from Spanish, I think) I opted for here to provide same. Are you able to enlighten me, please? I’m assuming, of course, that any one you may have is in English to begin with. With thanks in anticipation. Best wishes, MM.